Our members are proud to support Literacy for Life. They seek to improves live by teaching adults literacy skills required for self-sufficiency, better health, and meaningful participation in society. 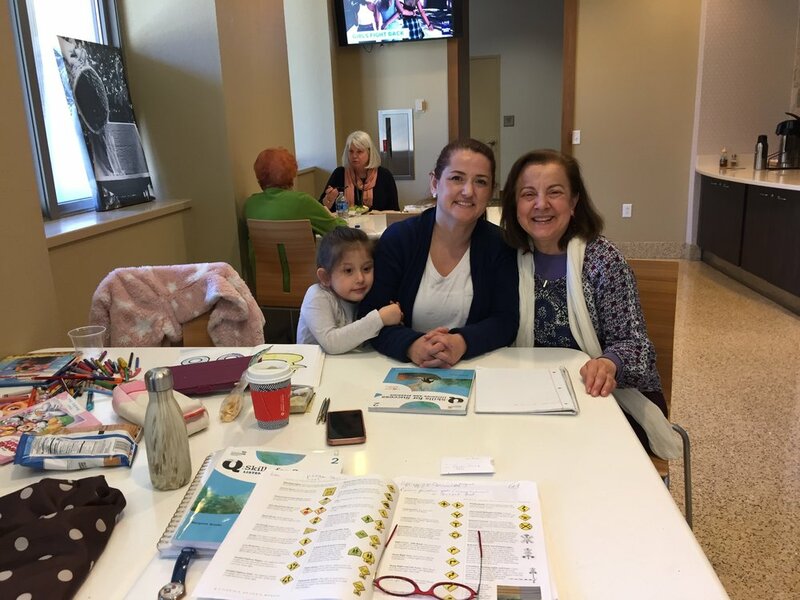 Satellite Rotarian Carmelina Trifiletti (right) tutors learner Tulay Korkmaz(center) weekly in English, through the Literacy for Life program. Tulay and her family arrived recently from Turkey. Her daughter looks on approvingly, undoubtedly thinking how smart her mom is to develop English language skills and gain an understanding of American life, government, history and culture. This tutor/learner relationship is developing into a long-term friendship. Tulay and her chef husband recently bought a local restaurant where they serve great food and provide employment opportunities in our community. This is Rotary Connecting the World, right in our own back yard.